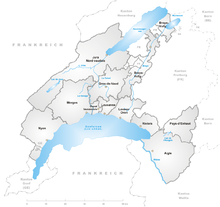 Vaud (French pronunciation: ​[vo]) is ane o the 26 cantons o Swisserland an is locatit in Romandy, the French-speakin soothwastren pairt o the kintra. The caipital is Lausanne. 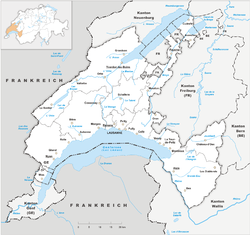 The name o the Canton in Swisserland's ither leids are Vaud in Italian (Italian pronunciation: [vo]), Waadt in German (pronounced [ˈvaːt]), an Vad in Romansh. There are 376 municipalities in the canton. Wikimedia Commons haes media relatit tae Vaud. This page wis last eeditit on 4 Mairch 2018, at 03:13.